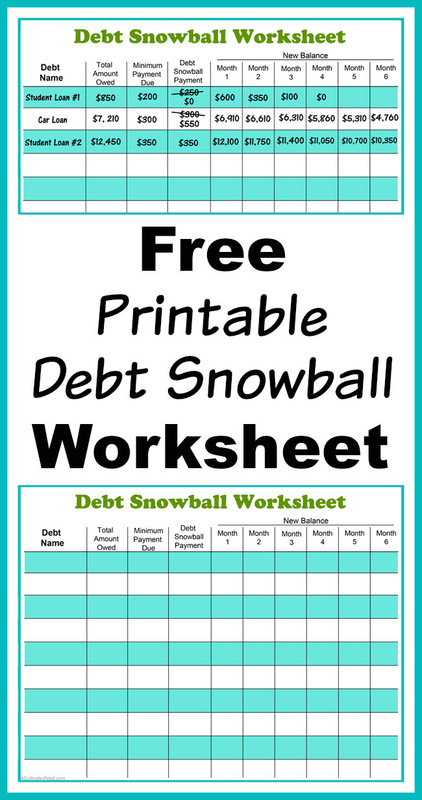 Free Printable Debt Snowball Worksheet- Pay Down Your Debt! Free Printable Debt Snowball Tracker Chart. Although any time is good, the start of a new year is a great time to begin a different approach to paying down your debt! Let this be the year that you make a big dent in your debt, or maybe even get debt free! One of my favorite ways to tackle debt is with Dave Ramsey’s debt snowball method because it’s proven to work well when you have debt from multiple sources. 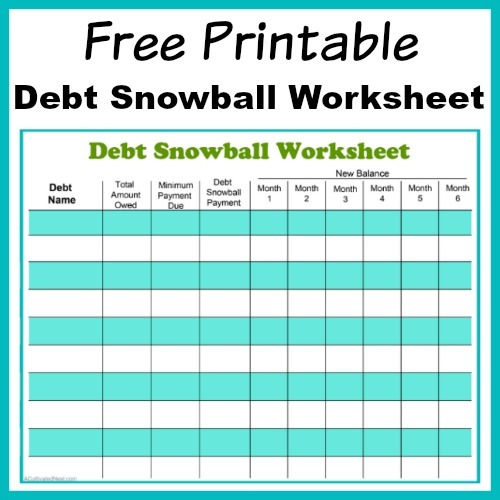 To make it easier for you to start your debt snowball, I created a Free Printable Debt Snowball Worksheet! We have lots of budget printables available in our shop and for free to help you on your debt free journey. Let’s get started! The debt snowball is part of Step 2 of Dave Ramsey’s 7 Baby Steps. The step before it is to create an emergency fund. I highly recommend not skipping that step. It’s so much easier to work at paying down debt when you know you have some extra money set aside for emergencies! 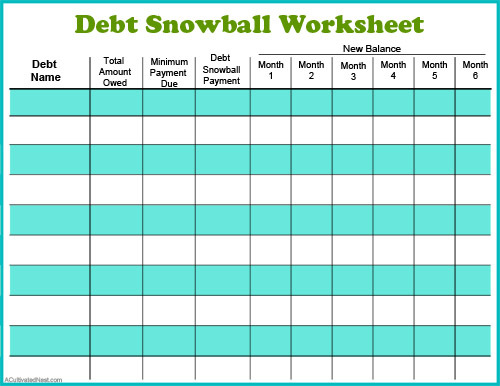 This free printable debt snowball worksheet is pretty easy to use. On the left you write in the names of all your different debt sources, like “Credit CardX”, “Car Loan”, “Student Loan #1”, “Student Loan #2” etc. This debtbuster worksheet works best if you put the smallest debt at the top of the list and the biggest debt at the bottom. Next to that you put the total amount you owe for that debt. Don’t just guess this amount, actually check your statement or log into your account to get the exact number. After that, you record the minimum payment you have to make for each source of debt each month. If you are paid ahead on a loan (which is great!) still record what the minimum payment would be if you weren’t ahead. Next to that, record your debt snowball payment amount. In the beginning, this will be exactly equal to your minimum payments, unless you’re choosing to pay more toward your debts (which is also great!). The idea of the debt snowball is that you pay off your smallest debt first, working your way up to your largest debt. When the smallest debt is paid off, you don’t keep the money you were paying toward that debt. Instead, you take the money you were using to pay off your smallest debt and start using it to pay off your next biggest debt. So in the beginning you may just be paying the minimum on your largest debt. But in the end, you’re paying all the money you were paying toward all of your debts, paying down that big debt really fast! For example, in the image above, once Student Loan #1 was paid off, the family started putting the $250 they were paying toward it and added it to the $300 they were paying toward their car loan. Now their car loan will be paid off even faster! I suggest filling out this worksheet with a pencil, so you can easily update numbers like the debt snowball payment amount as they change. Next to your debt snowball payment are 6 places to record each debt’s new balance by each month. This is a visual way for you to see your deb getting paid down! 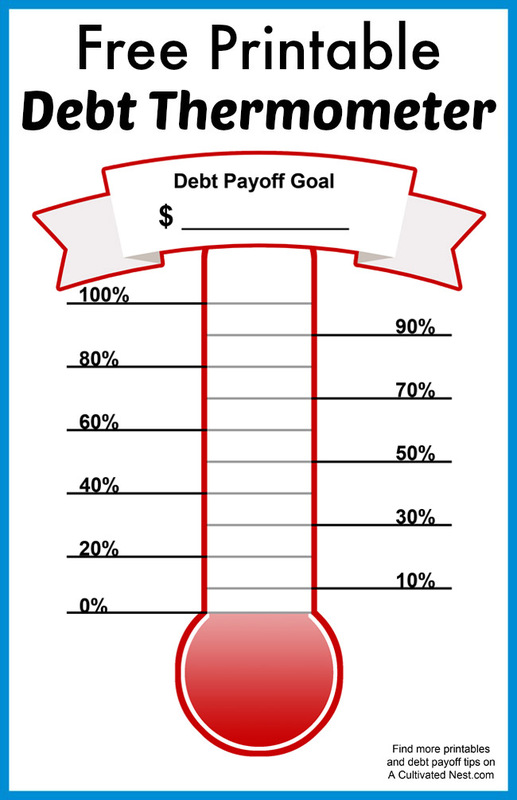 You also might want to try printing out my free debt thermometer, as another way to visualize your debt repayment. Seeing your debt getting paid off is very motivating, so it never hurts to visualize it in more than one way! 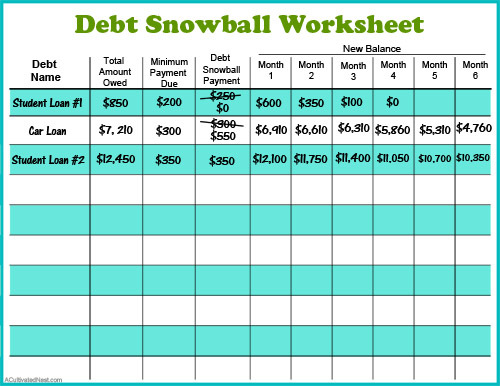 You can get this free printable debt snowball worksheet at the link below. Click here to get our printable watercolor budget binder! Let me know if this free debt snowball tracker is helping you. What method are you using to pay down your debt? I went thru Uncle Dave’s university more than 8 years ago. I need a refresher course! Still no emergency fund.